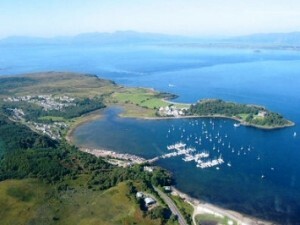 Your charter with Alba Sailing begins at Dunstaffnage Marina which is situated just 3 miles from the centre of Oban. From here, you could sail north east up Loch Linnhe for about 10 miles to Port Appin where tasty local seafood meals are available at the local restaurant. Alternatively head south down the Firth of Lorne for about 15 miles to Puildobhran (Pool of the Otter) and walk over the hill to find an ancient hostelry next to the 18th century ‘Bridge Over the Atlantic’. 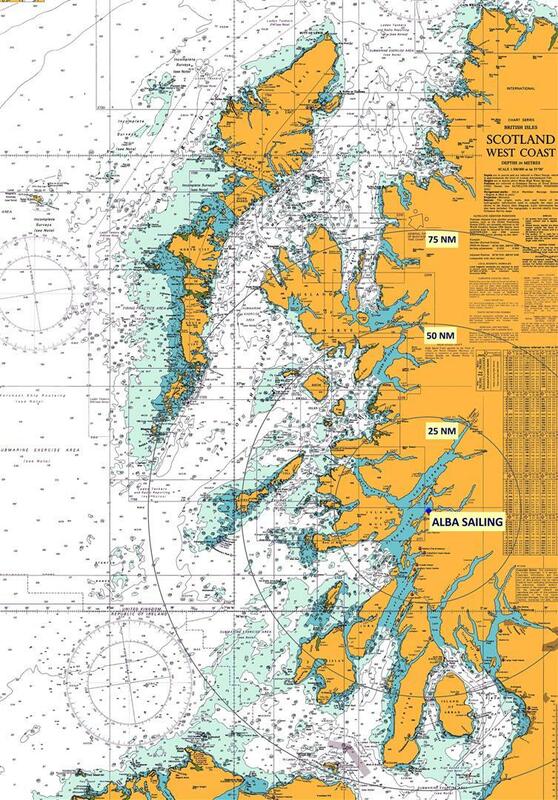 Heading up The Sound of Mull, at the northern end, lies Tobermory some 27 miles from Dunstaffnage Marina. The town is usually a hive of activity and is famous for its colourful frontage and stories of Spanish Galleons that sank in the bay in 1588. On into Loch Sunart you will see palm trees and in season, rhododendrons blooming right down to the water’s edge. Loch Sunart is surrounded by mountains and looking east you may even be able to see Ben Nevis – Scotland’s highest mountain. Next day you could sail to the Isle of Coll and be enchanted by the wildlife, the lonely isolation and pace of life. Coll has a pretty setting, has many hours of sunshine and low rainfall. South via the volcanic Treshnish Islands which are home to many thousands of puffins you could sail past the island of Staffa and Fingal’s Cave to perhaps visit Iona and its Abbey which was the last resting place for generations of Scottish monarchs. After anchoring in the picturesque Bull Hole or Tinker’s Hole for the night, you could go south via Colonsay to Islay, home of another “classic malt” distillery. Still further south you could pick up a mooring off the beautiful Isle of Gigha and walk round the lovely sub-tropical gardens followed by a visit to the Gigha Hotel which offers a special welcome to yachtsmen. 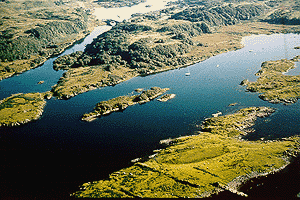 The more adventurous could enjoy a passage to the Outer Isles and visit Eriskay – where Bonnie Prince Charlie first set foot on Scottish soil – or visit Castlebay on the Isle of Barra, see the castle in the middle of the bay, and be amazed at the scheduled flights landing on the beach at the north end of the island when the tide is out. Moving north, the Outer Hebrides stretch for some 130 miles comprising 200 or so islands, only 13 of which are inhabited. You could choose to circumnavigate Skye going via Rhum (population about 30) and visit historic Kinloch Castle or via Canna (population about 20) which has only just been connected to mains electricity. Here you could walk up Compass Hill to see if you can work out why it causes havoc with ships compasses. 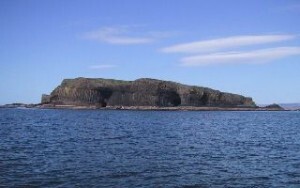 The island of Eigg, which was recently purchased by a crofters’ co-operative, is another possible stopping off place en route to Skye. At Loch Harport you might visit the Talisker Distillery (a third “classic malt”), or sail north to Loch Dunvegan or round the north of Skye, then south via the remote islands of Rona and Raasay to Portree or Plockton where palm trees grow by the water’s edge, then south via the Kyle of Lochalsh and under the Skye Bridge to Arisaig, Tobermory and back to base. 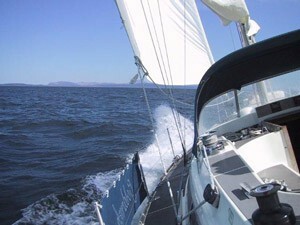 No matter which route you choose to sail, the most breathtaking seascapes will surround you. The hills, mountains, islands, lochs and inlets take on a magical appearance when viewed from the sea. The myriad of legends and mystique surrounding these parts, the relaxed informal way of life of the locals, the bustling pubs with the occasional impromptu ceilidh, the remote isolated communities, the spectacular wildlife including dolphins, porpoises, seals, whales, rare species of birds or the ancient archaeological remains all add to the attraction. The Western Islands have their own history, the people their own language and a culture far removed from the pace of life in mainland Britain. Those visiting for the first time are usually so spellbound by Scotland’s beauty and seclusion that they are drawn back again and again to revisit old haunts and explore new lochs and islands. You can download a ‘zoomable’ copy of this chart here.